Manic: Me! My former boss once lovingly gave me the nickname, Calamity and it still sticks, I must admit. 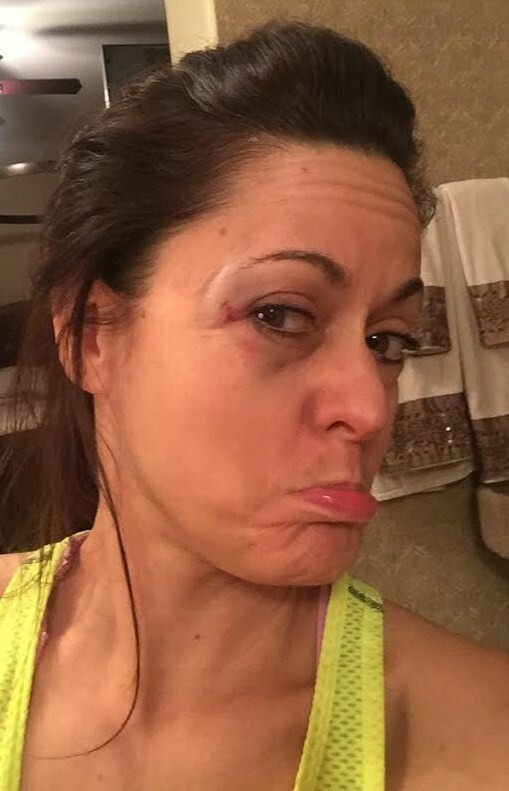 When I saw her recently and reported to her that I gave myself a shiner (details below), she wasn’t surprised! 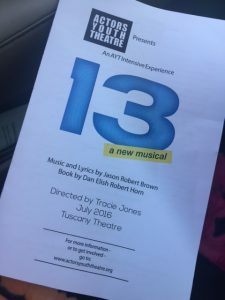 And of course, I did this the same week that my daughter was set to perform in the summer musical production we had been anticipating. Hiding out while my eye healed wasn’t an option. Because that is what mothers do. We keep going. Managed: I followed the healing plan advice of both my mom and my mother-in-law. 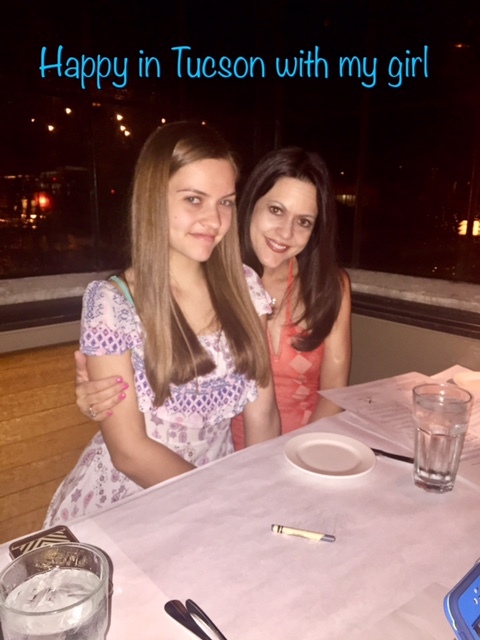 I am incredibly blessed to have these two amazing women in my life and although we all live far apart, we communicate regularly and I benefit from that, let me tell you. I applied an ice pack that first night, 15 minutes on and 15 minutes off, for the next few hours. But I really like homeopathic remedies and my own mother certainly raised me that way. I wish I would have remembered that first evening that I had a fresh tube of Boiron Arnicare Gel on hand, but I didn’t. Several days later, and after a lot of agonizing about just how bad my eye looked, I remembered! And it made a big difference. But first let me tell you how I got my impressive shiner in the first place. It was a tale of me against the glass dining room table. Here is a photo of the enemy and guess who won?! Not me! 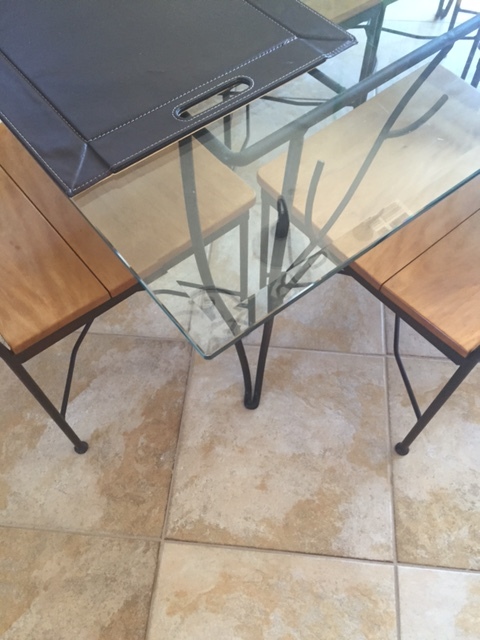 The corner of that table was a painful collision! Calamity in action. When one of our kitty cats ran under the table, I bent down to get her. I came up too quickly, failing to navigate my return to standing. I never made it to standing. Falling and clutching my eye is what happened next instead. I knew it was going to be bad because it was quite the blow. At first it didn’t look too frightful, although I still pouted as I worried about the progression in the coming days. I hoped that this was as bad as it would get. So I started to faithfully ice my eye the rest of that long evening. Finally, it was bedtime and when I woke the next morning, I had a full-fledged shiner. Just what I hoped to avoid! What a difference 8 hours makes and not in a good way. Still pouting 🙁 Much worse next day. So, I laid around and iced it all day long. 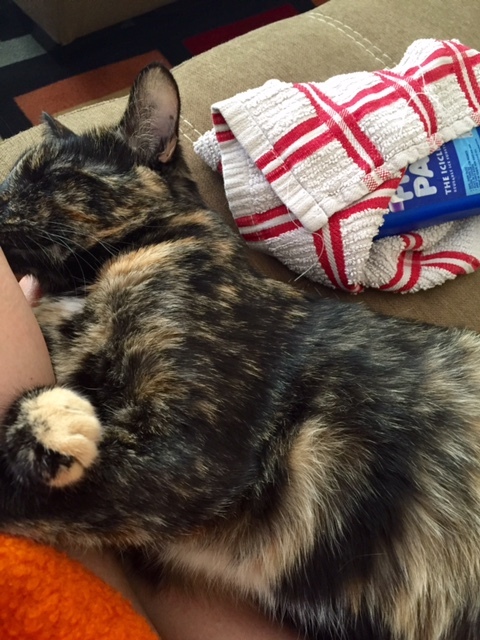 I got some kitty pity from my feline (she is not the guilty one from the night before, although she usually is the naughty one, but not this time). The next day was not much better and my daughter’s opening night was now only 2 days away. Finally, I remembered my Boiron Arnicare Gel! As soon as I did, I ran upstairs and immediately starting treating my eye with the wonder gel several times a day. My mother asked me if I was applying an arnica gel to the area and I told her that I had just remembered to do that. Boy, do I wish I would have thought of it a few days before. 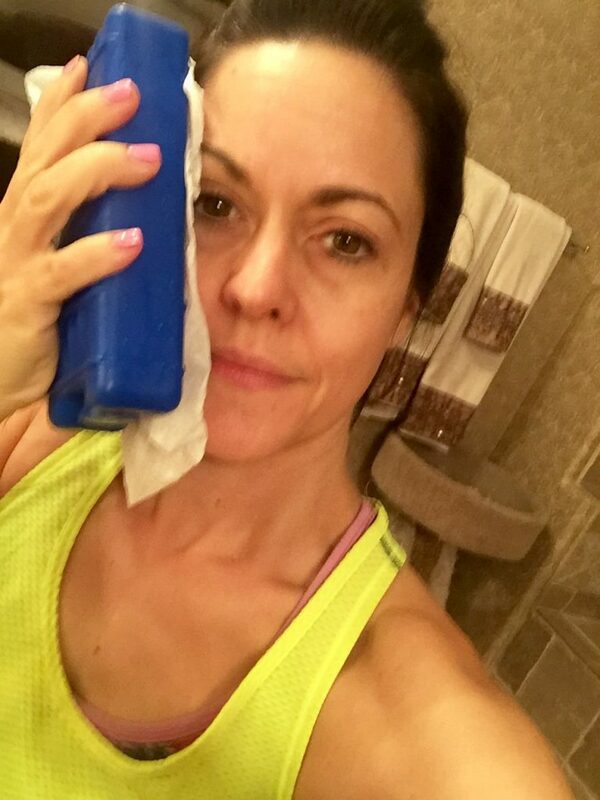 Once I started incorporating the Arnicare Gel into my recovery plan, my black eye truly started to fade! 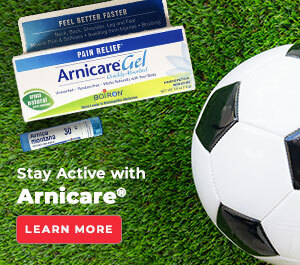 The healing was kicking into high gear with the help of the Arnicare Gel. You can see the improvement below. 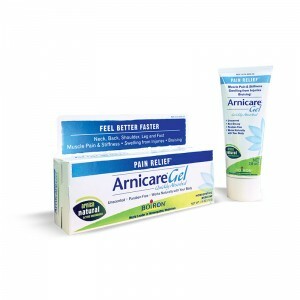 Arnicare Gel is made with Arnica montana, a type of mountain daisy that grows in the mountains of Central Europe. WebMD says that arnica can be applied to the skin for pain and swelling associated with bruises, muscle aches, and sprains. 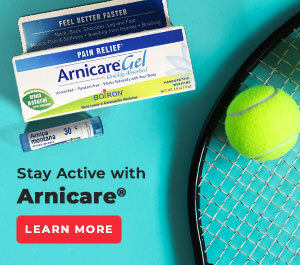 My mother swears by Boiron Arnicare Gel and I have tried this gel myself for sore muscles in the past and it worked well. 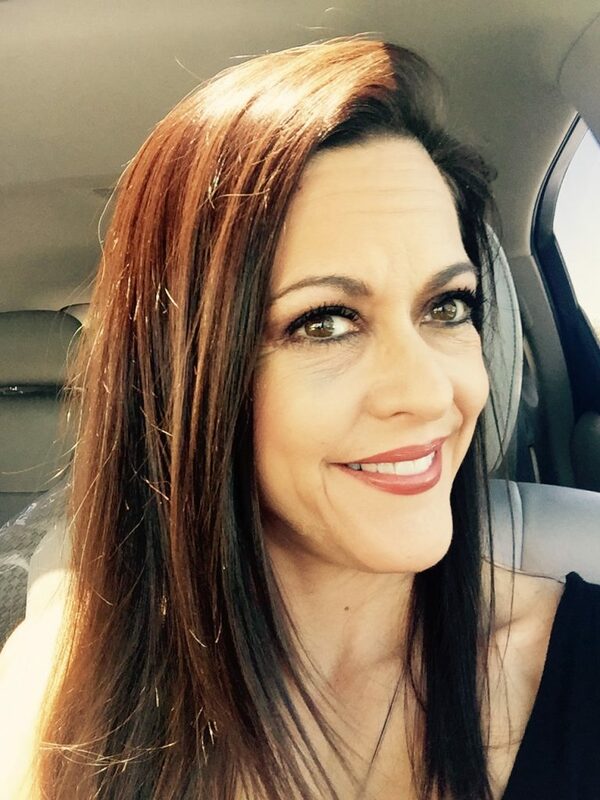 I was so happy to remember that I had some on hand because once I started applying a little of the non-greasy homeopathic gel to my eye, it made a difference. Still there, but starting to fade, so no more pouting! But that pesky black eye still wasn’t completely gone and my girl’s show was the next evening. 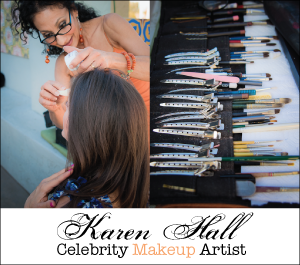 So, my wonderful gal pal, and managedmoms.com beauty expert, Bianca came to my rescue with a quick makeup lesson on what she recommends for good coverage. 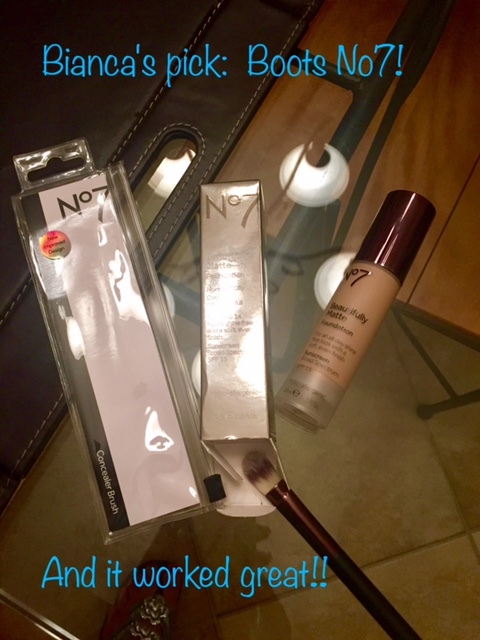 Boots No 7 Beautifully Matte from Walgreens. Not bad. And this is hours later so the makeup had faded some, but was still doing a good job, especially when it was time to take post-show pictures, I am happy to report! Here I am with my babies. 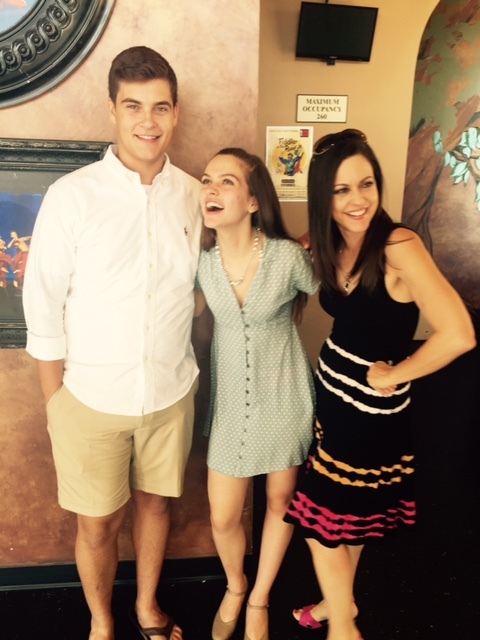 Since my son has gone off to college, anytime I can get a picture with my cuties, I jump at the chance, even with a black eye! 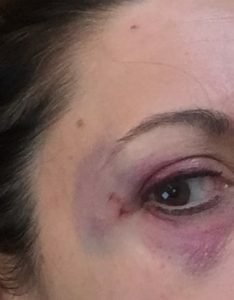 My sporty black eye wasn’t gone yet. But within another week of faithfully using Boiron Arnicare Gel, getting my sleep, taking vitamins and eating well, it was just about gone. And this happened by the time our family took a quick last minute weekend trip before school started. We snuck away to a great resort in Tucson. (My blog post with my review on that property coming soon.) 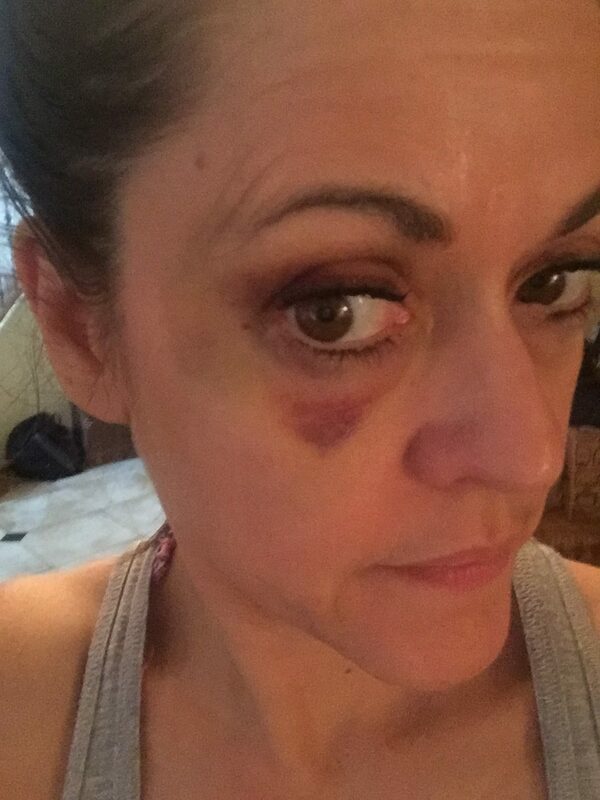 A black eye can take close to three weeks to completely disappear, so I was happy with my progress, let me tell you! I definitely recommend getting a tube to keep on hand. Because you never know when you are going to need it. I figured that I would use mine for sore muscles. 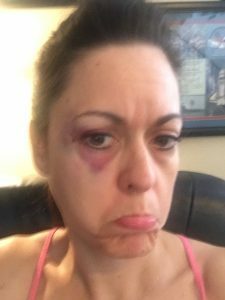 A black eye at 49 years old?! Now that, I didn’t plan for! So, I am sure glad that I had some in my medicine cabinet because believe me, I wasn’t going out in public more than I had to during that frustrating time! Boiron Arnicare Gel to my rescue! It can be ordered online and it is sold at Whole Foods and Target locations. A complete store finder for your area can be found here that shows where Boiron Arnicare Gel is sold locally. Note: I am not a doctor or a pharmacist, so you may want to first check with your doctor before using an arnica gel. These “Uses” have not been evaluated by the Food and Drug Administration. For me, it worked great. 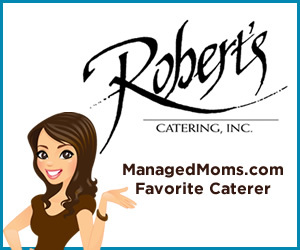 I was lucky to first learn about Boiron Arnicare Gel when they became an advertising partner with managedmoms.com. I swear by it ever since, especially since my mother also had used arnica gel for healing. My opinion about how much I love Boiron Arnicare Gel is 100% my very own.